The French authority responsible for administering the country's anti-filesharing operations reports that it has now sent out more than 736,000 "first strike" and 62,000 "second strike" infringement warnings, with a total of 165 Internet account holders now on their third and final strike. Meanwhile, a report set to be published by IFPI next week will suggest that Hadopi is a success that has contributed to a 22.5% increase in purchases from iTunes. In January 2010, the French authorities put in place what they believed would be the solution to the problematic issue of unauthorized online file-sharing. Their so-called “three strikes” or “graduated response” scheme would see Internet account holders receive an official warning should their IP addresses be linked to uploads of infringing material on file-sharing networks such as BitTorrent. Hadopi, the agency tasked with administering the system, started sending out the initial warnings in October 2010 and has periodically provided stats on how many first, second and third strike notices have been issued. Using the latest available data, PC Inpact‘s Marc Rees has created some graphs showing the progression of the scheme since the delivery of those first warnings some 15 to 16 months ago. The first chart above shows that as of November 2011, 736,000 “first strike” emails had been delivered to Internet subscribers. 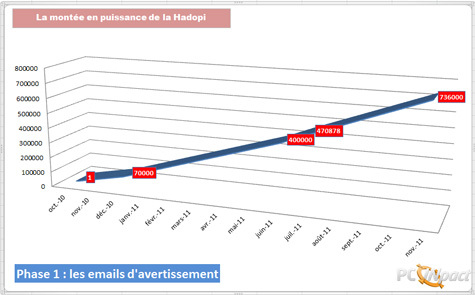 Hadopi president Marie-Françoise Marais previously reported that September had seen the agency send out its 650,000th notice. 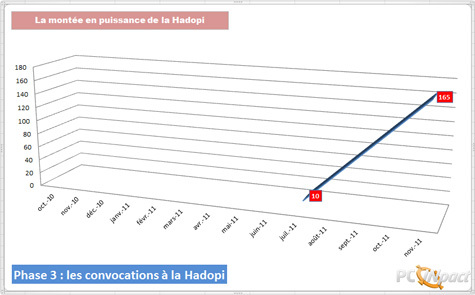 Chart two shows the number of “second strike” notices sent to Internet subscribers. Rather than via email, these are delivered to individuals by traditional recorded delivery mail. The latest data shows that 62,000 of these notices were delivered to November 2011, up from just under 20,600 delivered by July 2011 and 44,000 by September 2011. The third graphic shows the number of Internet account holders being held responsible for a total of three online copyright infringements. As of November 2011, 165 subscribers were on their third and final strike, up from 60 citizens two months earlier in September. But the big question, however, is whether the warnings are causing the French to swap a file-sharing habit for one which involves spending money with official outlets. Next week the big labels will support a study which claims that is indeed happening. According to Numerama, next Monday the IFPI will publish a study which will apparently show that during the last 18 months the Hadopi environment has led to a 22.5% increase in purchases from iTunes and an extra 13.8 million euros for the French market. We’ll certainly be taking a closer look at these figures when they become available. 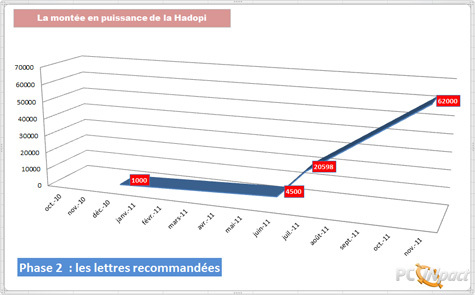 In September 2011 it was revealed that Hadopi asked the French Ministry of Culture for 12 million euros to finance its operations in 2012. It was granted 11 million euros.